The Annual WFMU Record Fair Is This Weekend! Facebook&apos;s algorithms may be smart, but they haven&apos;t always been tactful when it comes to dealing with the profiles of deceased users – but that could be about to change. In a blog post, chief operating officer Sheryl Sandberg announced that Facebook would be making the following updates: "a new tributes section for memorialized accounts; additional controls for people who manage memorialized accounts; and improved AI to keep the profile of a deceased loved one from appearing in painful ways". Facebook introduced the ability to memorialize accounts as "a way for people on Facebook to remember and celebrate those who&apos;ve passed away", and it allows friends and family to see content the deceased person shared while making it clear that they are no longer alive by adding the word &apos;Remembering&apos; in front of their name. The blog post specifically mentioned that Facebook is trying to get "better and faster" at stopping memorialized profiles "showing up in places that might cause distress, like recommending that person be invited to events or sending a birthday reminder to their friends". 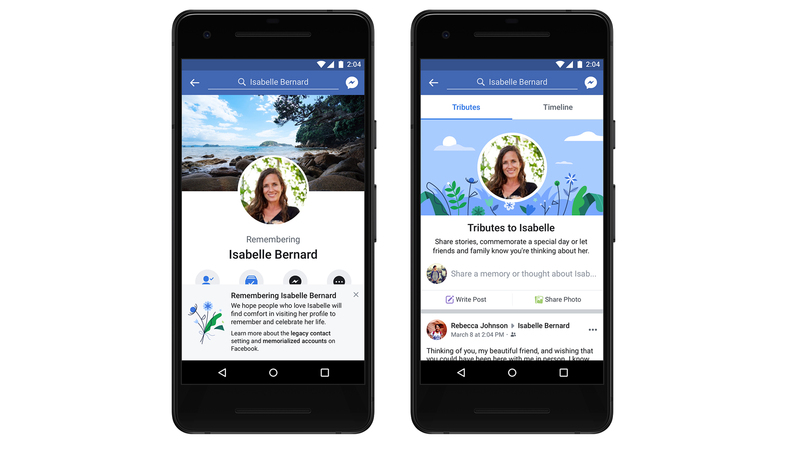 Facebook has also introduced a new &apos;Tributes&apos; section to memorialized profiles, "a separate tab on memorialized profiles where friends and family can share posts — all while preserving the original timeline of their loved one". As well as that, legacy contacts – a friend or family member entrusted to look after a user&apos;s Facebook profile after their death – have been given new controls, which allow them to "moderate the posts shared to the new tributes section by changing tagging settings, removing tags and editing who can post and see posts". Sandberg says that this means that legacy contacts can hide "posts that might be hard for friends and family to see if they’re not ready" from these people specifically. She goes on to say that, while minors can&apos;t select a legacy contact, Facebook has "recently changed [its] policies to let parents who have lost children under 18 to request to become their legacy contact". Facebook has been criticized in the past for not allowing bereaved parents have access to their children&apos;s accounts. In 2015, Germany&apos;s Federal Court of Justice ruled that the social media company had to grant a mother access to her deceased daughter&apos;s account, in what proved to be a landmark ruling in the subject of the &apos;digital afterlife&apos;.